To improve education for American Indian and Alaska Native (AI/AN) students, tribal leaders, educators, and Native youth called upon WHIAIANE to collect information on school environment experiences — from teachers, parents, community members, and the students themselves. Tribal leaders and tribal communities wanted members of the initiative to hear about the challenges these students face in gaining high-quality education, with a focus on the quality of their school environments. To meet this need, WHIAIANE, in collaboration with OCR, worked with tribal leaders and communities to design and execute a series of nationwide listening sessions regarding the school environments of AI/AN students. In October and November 2014, nine gatherings were held in seven states from New York to California to Alaska. These sessions drew over 1,000 attendees in total and allowed WHIAIANE and OCR to gather information from all stakeholders in AI/AN education. WHIAIANE acted as a listener, allowing students and others to speak openly about their school environments. “You just have to be you, and you just have to be real. The only way to change things is to hear from real people,” said Valerie Davidson, trustee of the First Alaskans Institute, who served as the moderator for the listening session in Anchorage, Alaska. WHIAIANE imparted similar instructions at each session in an effort to encourage a safe environment for participants to share their stories. Throughout the sessions, the initiative collected information about the challenges related to school climate, including bullying, student discipline, potentially harmful Native imagery and symbolism, and the implications of all of these school climate issues. With regard to Native school mascots and symbols, the initiative is aware that some people strongly favor retaining their school mascots. During the listening sessions, however, initiative staff members did not hear this viewpoint; thus it is not reflected in this report. WHIAIANE found feedback from these sessions invaluable in forming its recommended next steps. The initiative further expects that information from these sessions will guide its future work and goals — to address the unique and culturally related academic needs of AI/AN students and to ensure that they receive an excellent education. TEDNA was one of the grantees. On October 15, White House Initiative on American Indian and Alaska Native Education (WHIAIANE) released a school environment report called the School Environment Listening Sessions Final Report. The report was released and announced by William Mendoza, Executive Director of WHIAIANE at the National Indian Education Association’s Convention in Portland, Oregon. 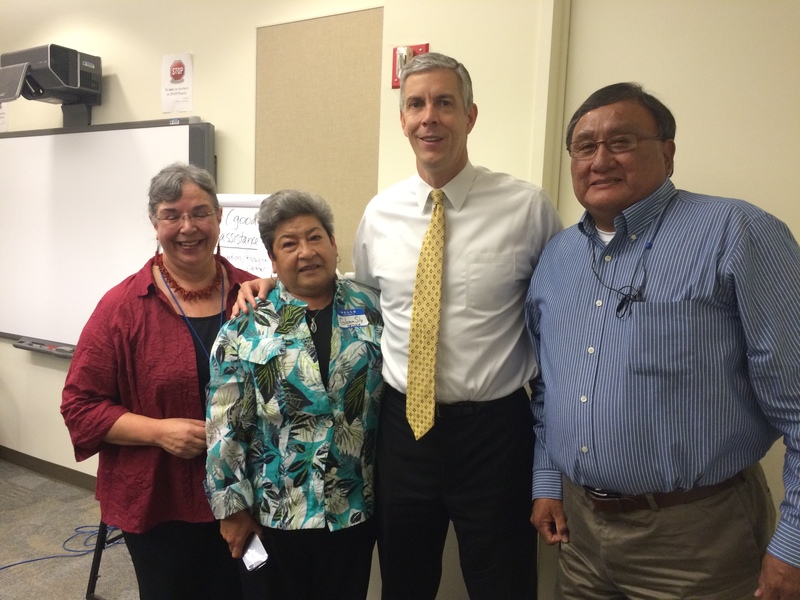 As part of the school environment listening sessions WHIAIANE heard from Native youth, schools and communities on ways to better meet the unique educational and culturally-related academic needs of Native American students. Throughout the sessions, WHIAIANE collected information about the challenges related to school environment including bullying, student discipline, potentially harmful Native American imagery and symbolism, and the implications of all of these school environment issues. The School Environment Listening Sessions Final Report is a summary of the findings from the October and November 2014 listening sessions. It identifies common issues and suggests recommendations to address the concerns shared by teachers, parents, community members, and students. Please join us for a brief conference call about the contents of this report. The Department of Education press release is available on the ed.gov website. The School Environment Listening Sessions Final Report on the WHIAIANE website under the Native Youth Environment Initiative tab.